All of the Smartphone users know very well about the WhatsApp. With the help of WhatsApp you will be able to send or receive different audio, video, text messages to another Smartphone user without any charge. Recently company starts voice calling facility on WhatsApp which we already discussed in previous post. Today WhatsApp is very popular messenger app around the world which is used on different Smartphone, millions of users are use this app because it is easy to use, easy to install and free of cost. How you could download WhatsApp for Android mobiles? You know very well that WhatsApp has offline conversation backup facility. Lot of time you suddenly lost your all-important chat history of WhatsApp but there is no need to worry because you can easily recover you all previous chat history by clicking on this topic how to recovery of deleted WhatsApp chat on Windows Mobile phone. Step 1: Go or open the official website of WhatsApp. Step 2: Download latest version of WhatsApp v 2.12.45 on your Smartphone. Step 3: Install this version in your Smartphone. Step 4: Now, open Settings option > Select Chat Settings option > Chat Backup > Select “take a backup to Google Drive” option > Type your Gmail account in which you want to save your chat conversation. Note: Currently backup option of online conversation to Google drive is only for Android Smartphone not for iOS and Windows phone. Now quickly install latest version of WhatsApp from official website of WhatsApp and keep safe of your online chat history on the basis of daily, weekly or monthly on the Google Drive. 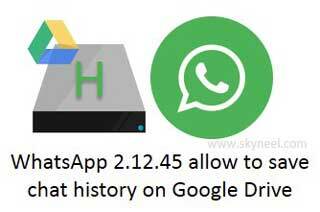 I hope you like this Save WhatsApp chat history on Google Drive, give your important suggestion regarding this post in the comment box. Thanks to all.